Matthieu Richard has arrived at the Monsoon Cup confident that he can silence his critics and claim his maiden ISAF Match Racing World title. The Frenchman has led the World Match Racing Tour (WMRT) from the opening regatta of the season at Match Race France in April and heads into the season ending event in Malaysia with a 15th point advantage over Adam Minoprio. The pressure has been mounting on Richard in the recent weeks after failing to make it through the qualifying stages of the last event in Bermuda, while people have also questioned the Frenchman’s decision to race in Perth last week with Richard having a poor track record of racing back to back. Richard remains unfazed by other people’s thoughts and is confident he can stand up to the pressure and win the title saying, “We thought long and hard about going to Perth and chose to go there to purely prepare for the Monsoon Cup. Our goal was to build up to this week and get a good feeling. We wanted to practice our starts against high quality opponents and overall i'm delighted with how we sailed. It would have been nice to beat Robertson but we only lost 3-2 and it gave us some time off to relax and have a break. The winner of the RC 44 Championship Tour 2010 will be crowned at the end of the regatta, alongside the match race and fleet race champions. The ORACLE RC 44 Cup Miami will also be the first ever RC 44 regatta on US territory. November 30, 2010 – Miami, Florida, will host the sixth and final regatta of the RC 44 Championship Tour 2010 on December 7-12. Organized by the RC 44 Class Association, the ORACLE RC 44 Cup Miami will reassemble 14 strict one design RC 44’s. The event will be special in many ways. Indeed, it will be the first ever RC 44 regatta on US territory; it will reassemble a record number of entries and it will be the culmination of the season, with the overall, fleet and match race titles awarded to the best teams and sailors of the year. The ORACLE RC 44 Cup Miami will start on December 7-8 with the match race contest, featuring some of the world’s best champions of the discipline such as Terry Hutchinson and Paul Cayard (USA), or America’s Cup winners Russell Coutts (NZL) and James Spithill (AUS). The second part of the event – December 10-12 – will be dedicated to fleet racing, with the team owners at the helm. 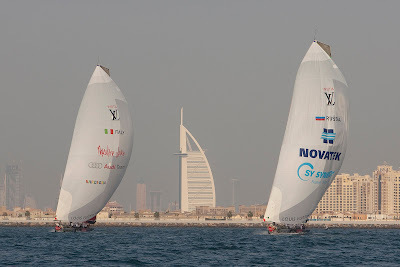 The RC 44 Championship Tour 2010 will be awarded to the best team in the combined fleet race / match race rankings. With one last event to complete, the annual ranking is currently led by Larry Ellison’s BMW ORACLE Racing (USA). Pieter Heerema’s No Way Back (NED), James Spithill’s “17” (USA) and Torbjorn Tornqvist’s Artemis (SWE) are within reach and will be fighting hard to grab the title. The first regatta of the RC 44 Championship Tour 2011 will also take place in the US, in San Diego, on March 2-6 whilst five teams will compete in Key West Race Week in January. It was another tense day on the waters off Dubai for Mascalzone Latino Audi Team that lost the only race against Synergy when a defective halyard clip suddenly opened, causing the spinnaker to come down. 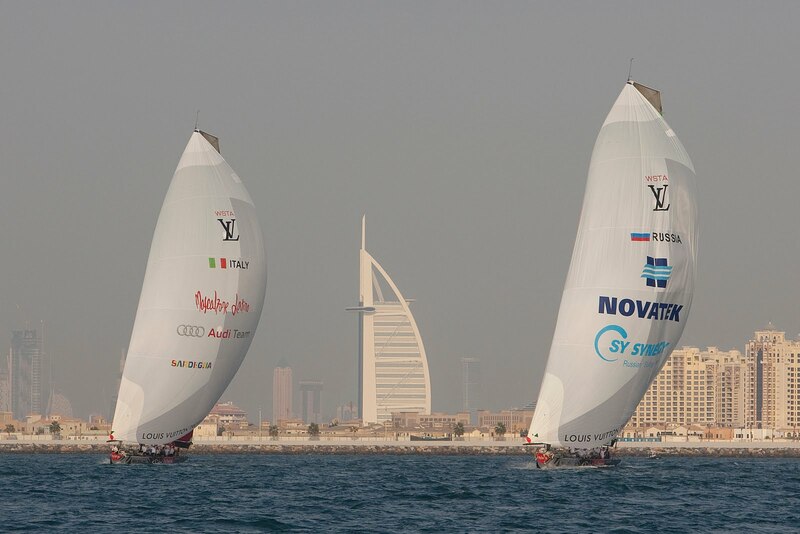 The Italian team’s third race in the Louis Vuitton Trophy Dubai got off with an intense duel in the prestart that cost the Russians a penalty flag after they hit the sticks at the stern of the Mascalzone Latino Audi Team yacht. The two yachts crossed the starting line neck and neck and although the Italians, led by Gavin Brady (NZL), managed to stay close, the Russians were able to make small gains that eventually became four boatlengths at the leeward gate. In the second beat, the “Latin Rascals” were able to catch up, closely following their opponents that still had to offload their penalty. While approaching the second weather mark, Synergy decided to carry out their penalty circle, most probably an extremely risky move since the distance from the Italian boat was too short to guarantee they would be able to hold on to their leadership. It didn’t take long to prove it was an unwise decision, as Gavin Brady (NZL) with great precision and timing, succeeded in getting through to leeward of them and beat them around the mark. It was a spectacular move by Vincenzo Onorato’s boat and the race was wide open once again. It truly was a feat that allowed the “Latin Rascals” to gain an advantage of a mere 3 seconds that then increased as the race went on. Then disaster stroke onboard the Italian boat: The spinnaker went in the water and the race turned upside down. It was gear failure while the crew was not to blame but the race was inevitably compromised. When the spinnaker was hoisted again and Mascalzone came back into the game it was too late. The Italians crossed the finish line 1 minute 14 behind the Russians. Unlucky Rascals but also substandard gear provided by the organizers. Today, onboard NZL-84, the yacht assigned to Onorato’s team, the first breakage was the gearbox of the winch, forcing the team’s grinders to Herculean efforts while seriously compromising the strategic options given the inability to tack or gybe effectively. The first failure was followed by the accidental opening of the halyard clip that according to Mascalzone Latino was defective and compromised the race. Tomorrow, weather allowing, Mascalzone Latino onboard USA – 87 will face in the first and second flight the German-French team ALL4One. The third flight will actually be the match that couldn’t be sailed today and Mascalzone will once again race against Synergy. 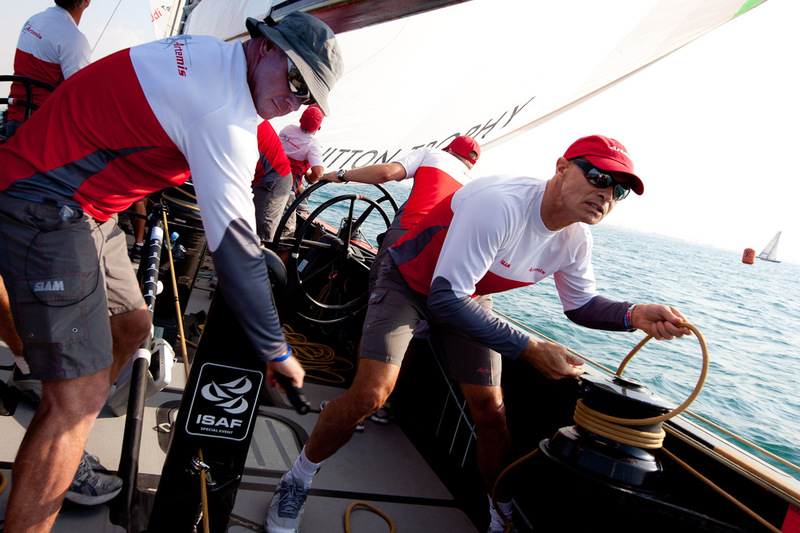 In that match as well, Mascalzone Latino Audi Team is assigned a New Zealand yacht, NZL – 84. The first race is scheduled at 1pm local time, 10am CET. Mascalzone Latino Audi Team are getting ready for the 2010 season closing event in Dubai that will also mark the end of the Louis Vuitton Trophy cycle. The appointment in the most famous and populated of the United Arab Emirates will start on November 12th with the inauguration of the Race Village and the opening press conference, while racing will kick off on Sunday, November 14th and will conclude on the 28th of the same month. Vincenzo Onorato, President of Mascalzone Latino, is moved by this last commitment of the ACC. "In Dubai, the "old ladies" that have accompanied us in the last 20 years of America's Cups will go on the water. These boats have made Italians dream and get passionate and allowed to deliver new technology standards applied to sailing and boatbuilding. The next Cup, as everyone knows, will be sailed on much faster and complex yachts, but everyone will remember with affection this era. I think Dubai will be able to write the last page of this era’s history with great pomp, in a parade of the world’s the strongest teams. " Marco Savelli, Team Vice President, looks confident in this historic event: "I think that after the excellent second place in Auckland, and the fifth in La Maddalena, where we almost got into the semifinals, this year our crew has proved capable of achieving good results. On this occasion as well, despite the top level of the competing teams, I expect a fight to the last gybe. I trust that Mascalzone Latino will obtain good results, and I can assure that we will do our best because we are aware of the responsibility to mark the history of this generation of boats with a nice final memory. " Vincenzo Onorato’s crew is led by skipper and helmsman Gavin Brady and will consist of Morgan Larson - tactician, Cameron Dunn and Flavio Favini - afterguard, Paul Westlake – mainsail trimmer, Steve Hayles - navigator, Rob Salthouse and Thierry Fouchier - trimmers, Matthew Welling – mainsail grinder, Scott Crawford and Andrea Pavan - grinders, Jamie Gale - travelers, Massimo Gherarducci - mastman, Alberto Barovier – mid bowman, Chris Dougall – grinder/travelers, Alan Smith – bowman and Santino Brizzi – afterguard/grinder. The Latin “Rascals” in Dubai will have to face BMW ORACLE Racing (Defender of the 34th America’s Cup), Emirates Team Zealand, Russia’s Synergy, the French-German team ALL4One and Artemis from Sweden. The host of the regatta will be Dubai International Marine Club will hold the regatta, usual organizer of the most important marine events in the southern part of the Gulf. As mentioned, in accordance with the Middle East custom of their will to be part of the history of an increasing number of international sports, by opening or closing a season as was the case in last few years with various classes of automobile, motorcycle and motorboat races, in this case, the event will enter the UAE annals as the last Louis Vuitton Trophy to be sailed on the current generation of America's Cup Class monohulls. The ACC has been used in racing in five different versions, with a total of completed 100 units, starting at the 28th edition in 1992 in San Diego and ending at the 32nd America's Cup, held in Valencia in 2007. "To be the culmination of a generation of America's Cup boats is a very significant and exciting for us and for everyone involved and passionate about sailing. Dubai will have the opportunity to once again be in the spotlight of the international world of sport," states an enthusiastic Saeed Hareb, Managing Director of DIMC. The Louis Vuitton Trophy Dubai is under the patronage of His Highness Sheikh Ahmed Bin Saeed Al Maktoum, Chairman of Emirates Airline, Principal Sponsor of the event. STOCKHOLM, Sweden (8 November 2010) – Artemis Racing confirmed today the team’s entry as a Challenger for the 34th America’s Cup, which will include competing in the America’s Cup World Series in 2011-2012 and culminate with the Challenger Selection Series in 2013. Speaking at today’s press conference Torbjörn Törnqvist, Chairman of Artemis Racing, shared his vision for the team and endorsed the new format for the America’s Cup. Torbjörn Törnqvist also spoke of the important role of the Royal Swedish Yacht Club (KSSS) in the team’s challenge. Over the course of the next three years, Artemis Racing will be focused on designing and building two AC72 yachts, while also developing a strong sailing team to compete in the AC45 World Series and the Challenger Selection Series. 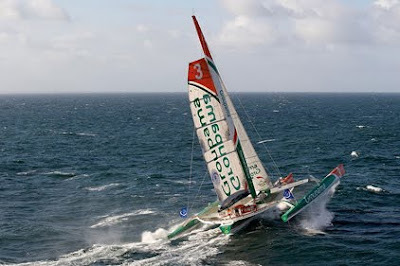 The clear goal is to challenge Cup holders BMW ORACLE Racing for the America’s Cup in 2013. “We have been orienting Artemis Racing toward the America’s Cup for more than a year. With much of the plan for the 34th America’s Cup now defined by the Defender, and an early start for the team, we have a tremendous opportunity to mount a winning campaign.” said Paul Cayard, CEO of Artemis Racing. Paul Cayard announced that world champion sailor Terry Hutchinson (USA) will be the team’s helmsman and that the design team will be led by Juan Kouyoumdjian, well known for his success with winning designs in the Volvo Ocean Race such as ABN Amro and Ericsson. The next event for Artemis Racing is the Louis Vuitton Trophy – Dubai, which begins on 14 November. Looking ahead to 2011, Artemis Racing will continue to compete on the RC44 World Championship tour, while joining the Extreme 40 Circuit and the America’s Cup World Series, which will be raced in AC45s. Normally, during this time of year, the tradewinds are generally nice and steady, yet it has to be said that this doesn't appear to be the case for the competitors in the Ultimate Class competing in the Route du Rhum La Banque Postale. Positioned 300 miles to the North of Groupama 3, Thomas Coville's Sodebo is enjoying stronger wind from a better direction to maintain a high average speed. In this way, the skipper has been able to make up 86 miles on the leader over the past 24 hours. Similarly, Francis Joyon, who is positioned to the East of Groupama 3, has made up 60 miles of his deficit, whilst Yann Guichard has lost around a hundred miles. On the Atlantic race zone then, things aren't exactly sticking to the usual routine. Variable both in terms of strength and direction, the wind is imposing a fast physical rhythm on the sailors, who not only have to keep watch for sudden surges of breeze to avoid capsizing, but also wind holes, so as they don't lose ground on their rivals by keeping an unsuitable sail configuration up for too long. To spice things up a bit, you have no prior warning about how long this phase will last: you think it's going to last a good while so you manoeuvre by hoisting or reducing the sail area. Lots of physical effort is involved at that point, as well as a drop in speed as you perform the manoeuvres. If your forecast proves to be right then it's BINGO. There you are carrying the correct sail configuration, happy with the efforts you've made to get where you are. Where the opposite is true, it's hell. You're stuck fast or forced to go up on deck to avoid the risk of capsizing. Such is the life of the multihull skipper, who only sleeps in 20 minute chunks. Suffice to say that as the skippers begin to tackle the sixth day at sea, just 1,338 miles from the finish, the fatigue must be seriously beginning to make its presence felt. There's no question of easing off the pace though: you have to earn a Rhum! Leading the fleet of 84 competitors still racing since the skipper of Côte d'Or had to be airlifted to hospital, Franck Cammas is continuing to extend his lead aboard Groupama 3. Never dipping below an average of 20 knots, the maxi-trimaran is now positioning her bows westward in a NE'ly breeze of around twenty knots, which is highly reminiscent of the tradewinds. Decidedly Franck Cammas likes challenges. Not only has he set off on this ninth edition of the Route du Rhum La Banque Postale aboard the largest and most powerful trimaran ever to be raced single-handed, but he has also opted for a S'ly option which a fair number of his rivals didn't believe would pay off. By making headway along a tiny vein of air along the Spanish coast in the same way as he did during his third and victorious attempt at the Jules Verne Trophy back in the winter, the skipper of Groupama 3 forced the pace so as to make it through before the gateway to the favourable winds closed behind him. Determined but also confident about the capacity for speed that his giant trimaran has displayed since leaving Saint Malo, Franck has really set a furious pace in this race: "It's true that sailing aboard Groupama 3, which is less flighty than the others thanks to her wide beam, enabled me to keep more sail aloft on traversing the Bay of Biscay". As such the skipper of Groupama 3 is confidently carving out his course towards the West Indies, without being overly concerned about his rivals. Some of these, like Idec and Gitana 11 are behind him on the same course, while others like Sodebo and Oman Air Majan are also behind but on a completely different course, further to the North, the outcome of which may or may not be relevant: "It's not easy to know if they're right. It'll come down to very little in my view. One thing for sure is that I couldn't see myself taking the N'ly option with Groupama 3". 2,700 miles from the goal, don't expect Franck Cammas to shout victory though, despite this great start to the race: "We still have a long way to go and it's not going to be a clear run. I'm going to have to traverse some zones with light airs, but it's true that for now I'm pretty much ahead of my routing whilst those on a N'ly option are behind". On a physical level, the skipper of Groupama isn't sparing any effort with the frequent, exhausting manoeuvres. However, thanks to Groupama 3's stability, he's managing to relax and even sleep in small 20 minute chunks when he gets the chance. This is no longer a constraint Bertrand Quentin will have to deal with and he is sure to be very disappointed to have had to retire his Côte d'Or from the race, but he will also be happy to know that physically he is completely safe tonight. 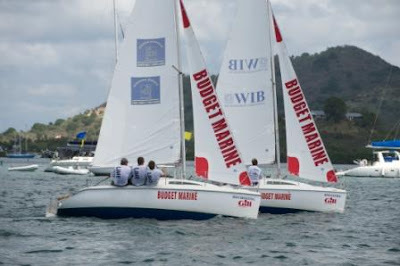 November 1, 2010-Simpson Bay, St.Maarten-The Budget Marine Match Racing Cup which will take place March 1st 2011, will once again showcase the skills and abilities of professional skippers from around the world. This 3rd edition of Match Racing which is a pre-event for the 31st St.Maarten Heineken Regatta will open its doors and host sailors from around the world. In the past teams from Poland, USVI, the United States and Russia have participated in this event and organizers are looking forward to hosting international sailors. Peter Holmberg of the USVI has won this race the first 2 years and many wonder if he will take home 1st place for a third time. Budget Marine is the title sponsor and is offering $10,000 in prize money this year. Match Racing started its journey with the America’s Cup races over 100 years ago and has been evolving steadily since then. History tells us that the first match race in one-design boats was the Omega Gold Cup in Bermuda over 50 years ago. The Budget Marine Match Racing Cup will use identical Jenneau SunFast 20’s for the race which are owned and operated by Lagoon Sailboat Rentals here in St.Maarten. With places up for grabs for eight teams, it is imperative that those who wish to partake send in their sailing CV’s to the regatta office at regatta2@heinekenregatta.com Once the selection process has been made teams will be notified of their participation in this 3rd edition Match racing event. The organizing committee has gone to great lengths to make sure that each year this event remains competitive and professional while still allowing the participants to enjoy the near perfect conditions of Caribbean sailing. It is their goal to host teams from around the word and showcase what the tiny island has to offer the world of sailing. Past participants of this regatta such as Peter Isler, Gavin Brady and Eugeny Nikiforov go head to head for the shot at taking home the grand prize, but Peter Holmberg has steadfastly held them at bay. Once teams have been selected to participate in this Match Racing Cup they must place a $500 deposit to secure their spot. Entry fee is minimal and once selected teams will be notified immediately. Applications are being accepted from all sailors, male or female who think they have what it take to compete. An ISAF ID is appreciated when sending in your information. Organizers are pleased to say there has never been a lack of interest for this race so make sure you send in your information as early as possible. The final date to send in your information is January 7th 2011, applications will not be accepted after this date.